“EGIDIUS (or GILES) RODRIGUEZ was born of noble parents at Vouzella in Portugal about A.D. 1183. His family destined him for the ecclesiastical state and sent him for his education to Coimbra, where he became eminent as a philosopher and devoted himself to the study of medicine. Several rich benefices had been obtained for him; but the young man entirely neglected his sacred obligations and even entered into an unholy compact with Satan, which he signed with his own blood. For seven years he is said to have studied magic in the caves of Toledo under his infernal master. When he reappeared amongst men, he was found to be endowed with a marvellous power over the elements and able to cure the most inveterate diseases. He took his degree at Paris as doctor in medicine and established his reputation by numerous and striking cures, evidently surpassing human power, whilst his life was one of unbridled iniquity. But God in His infinite mercy had decreed to change this unhappy slave of the devil into one of His own most faithful and loving servants. One night, as Egidius was pursuing his unholy studies with the doors locked upon him, an armed horseman of gigantic stature suddenly appeared before him, and, shaking his lance, exclaimed in terrific accents, “Change thy life! Change thy life, I tell thee.” The vision disappeared and the trembling Egidius cast a remorseful glance on the miserable past. But his bad habits soon regained the mastery. Then the fearful apparition came a second time, charged full upon the unhappy sinner, and hurled him to the ground, exclaiming thrice, “Change thy life or I will slay thee.” “I will change, Lord, I will change; pardon my delay,” faltered the miserable man. He rose an altered being. His first act was to consign all his books of magic to the flames. He then set out for Spain, took the habit of a Friar Preacher in the newly founded Convent of Palencia about A.D. 1220, and fervently entered upon a course of penance and devotion. But for seven years (the same term as that of his unholy apprenticeship to Satan) no comfort came to his anguished soul. Terrifying visions of demons continually assailed him and the thought of the contract signed with his own blood and binding him to the Evil One filled him with fear and remorse. Yet he persevered in prayer and penance, continually commending himself to her who is the Refuge of sinners and who is never invoked in vain. One night, when he was exposed to the most terrible assaults of the demons, the paper of his contract was suddenly and violently thrown on the ground before him, and an infernal voice cried aloud that Mary had conquered. Egidius took the bond, felt himself freed from his sufferings, and for the first time tasted the consolations of a soul perfectly at rest. From that time, he became as distinguished for his holiness and his seraphic love of God as he had formerly been for his apostasy and rebellion. He bore in particular a most tender devotion to the Holy Name of Jesus, the mere casual utterance of which often had the power to cast him into ecstasy. He became one of the most celebrated religious of his time, and was more than once Provincial of the Order in Spain. His miracles were very numerous, and his power over the evil spirits who had so long and so cruelly tyrannised over him was exhibited in many wonderful ways. One of his favourite maxims was that we must forget ourselves in the service of our neighbour, and that the salvation of souls must take precedence of all private devotions. There is something singularly attractive in the picture which is left us of the life and practices of this wonderful man. He would take advantage of the time when the Brethren were in the schools to clean and tidy their cells for them and would render the lowliest services to the sick. Being naturally of a cheerful and loquacious disposition, he found extreme difficulty in practising the rule of silence; but, understanding this to be a temptation of the devil, he resolved to live in strict retirement in his cell; and so generously did he overcome himself in this matter, that thenceforth he was hardly ever heard to utter a useless word. If anyone needed his help, he would at once lay aside his own occupation and hasten with a joyful countenance to render the desired service. His whole bearing attracted souls to the love of the Order and to the practice of poverty and obedience. He was ever ready to console the tempted and to render the humblest services to the sick Brethren. Benedict XIV. approved the veneration which had always been paid to Blessed Egidius in the Dominican Order and the kingdom of Portugal. *Some Dominican historians have cast doubt on certain elements of this story. Are these doubts justified? That question, unfortunately, is beyond my competence. But I can say this much: Bl. Bartolo Longo is surely not the only former slave of Satan who now dwells in the courts of Paradise! To encourage devotion to some of the “littlest souls” mentioned in the previous post (novenas, spiritual reading, spiritual friendship, etc.). Why? Because most of us are very weak and imperfect souls, and these holy souls can help us in different ways to attain a greater union with God. It is no coincidence that, in recent times, God has raised up so many souls that speak of littleness, abandonment, confidence, Divine Mercy, etc. The “littlest souls” are principally to be imitated in their voluntary littleness – i.e. in their audacious, childlike and total abandonment of self to the infallible, immutable, adorable and infinitely perfect Will of God. We should not, and indeed cannot, imitate the saints/Saints in everything. No two souls are the same; God leads all to Himself in a somewhat unique manner. His Will alone sanctifies souls. St. Therese, the youngest Doctor of the Church, has in some sense been held up by holy Mother Church as the flag-bearer for “little souls.” Her message is fundamentally universal. 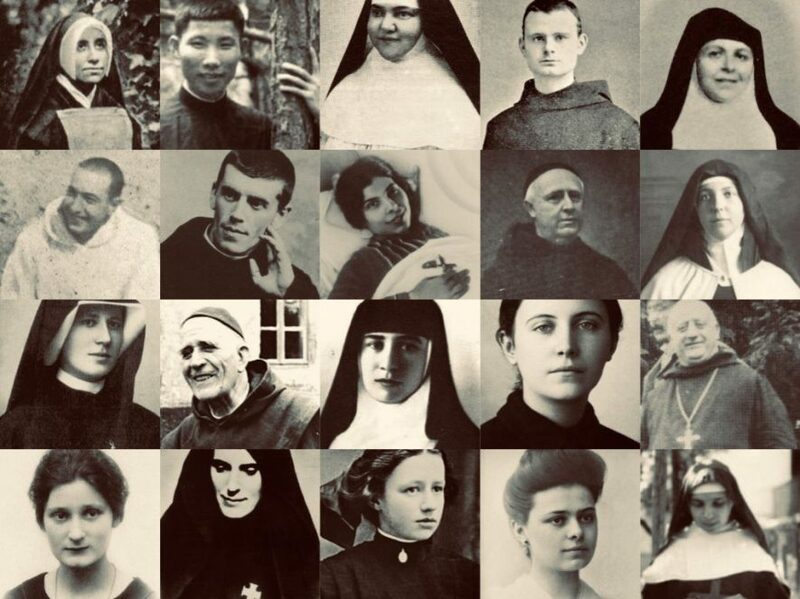 **Some links have been provided throughout this blog post for those who wish to learn more about some of these holy souls. On one occasion, upon hearing these Divine words, she asked where her dear Lord was. The reply? Are we not living tabernacles? Were we not created for love? Did Jesus not promise to abide with us and to make His home in us? How else did Bl. Alexandrina live on the Eucharist alone for years and years? How else are sinners fashioned into saints (a greater work than creation itself)? How else could St. Anthony Mary Claret have received the grace of having Jesus dwelling perpetually in his heart? The end of such considerations is to direct us to one place: the Tabernacle. “On the night of 29th to the 30th June, the last of the octave and the eve of the Feast of the Sacred Heart, Theodolinde’s [Théodelinde Bourcin-Dubouché, d. 1863] time for adoration was from one to three in the morning — this was God’s hour. She had scarcely knelt down, when she was seized by a grace which became usual to her; she seemed to be sensibly touched by the divine love, as if a sharp ray had emerged from the Host and reached her heart; so strong was the impression that she received that she felt as if she were dragged out of herself. ‘I wish for adoration and reparation in order to appease My Father’s justice, but all these associations are not sufficient. A religious consecration is needed . . . there must be souls always before Me so that they may receive My Life. … I will place on their hearts a channel of gold as I have just done to you . . .
+ Update: I am still working on a post about Mary; the working title is: ’33 Reasons to Consecrate yourself to Jesus through Mary.’ This will possibly take months (I spend roughly 5hrs a month on the blog, max.). I will try to post some brief articles in the meantime. Happy New Year, dear reader! And happy 100th anniversary of Our Lady’s appearance at FATIMA! Pray much for the Church and the world. The message of Fatima has not been heeded. Update: I am currently working on an article about consecration to Our Lady. Due to a want of time, this might take a while to complete. What is it that attracts God to our souls? Is it our virtue? Our strength? Our talents? Yes, okay – but what do you have of yourself? What do you have that you have not received? (Bear in mind that we do not have existence of or from ourselves; our essence is distinct from our existence). [Actually, there is an exception. Although we have neither existence from ourselves, nor talents, nor grace, we do have a unique claim to our sufferings and our sins]. This might seem all a bit depressing, a bit of a guilt-trip. But it isn’t. Rather, it is the foundation of happiness; it is the bedrock of the spiritual life, of a genuine relationship between the creature and the Creator; it is the key to holiness and, subsequently, to happiness. Because God’s essence is Love, He is always seeking our good; He longs to communicate His Divine Life – which is nothing other than Love Itself – to us, His dear children, for whom He has paid so great a price! Whether we are the greatest sinner in the universe or not, matters little; the only impediment to God’s action in us… is us. If we are full of pride, of self-sufficiency, then God has no room to act (pride and God are like oil and water); but if we are humble, acknowledging our frailty and leaning on God alone, He will supply for our deficiencies, He will fill our empty vessels, bit by bit (“… fill the hearts of Thy faithful… “). And the greater our need, the more God is glorified in helping us! Let Love be Love. Don’t try to give yourself to God; this is beyond your strength. Rather, ask God to take you to Himself. ‘I am thine: save Thou me’ (Ps. 118:94). God is more glorified by the feeble works of an imperfect soul who recognises her absolute dependence on God, and who trusts audaciously in His goodness, than He is by the most heroic acts of a soul who believes that, by their works, they are somehow giving God something that wasn’t already His to begin with; for ‘to Him nothing may be added’ (Eccles. 42:21). God alone communicates life and goodness to His creatures. Until we grasp this truth, our relationship with God will suffer. There is nothing quite like knowing that God’s love for us is perfectly pure; that He seeks us, not because of what we are, but because of what He is. In ALL THINGS, then, let us rely on Him, let us glorify Him, let us thank Him. This is the key to great holiness. A grateful soul is necessarily a humble soul, and a humble soul is necessarily a loving soul, being inundated, as it were, with the graces of God.